Isn't this a great picture frame? Curtis and Brandi gave it to me for my birthday and I couldn't wait to put pictures in it. 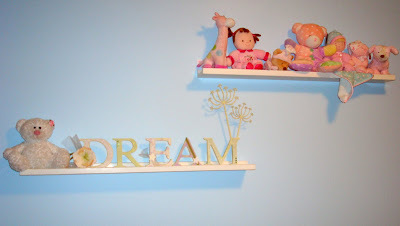 Some of Gracie's stuffed animals and a little decoration I made before Gracie was born. In the pre-baby, mat leave days, when I was so bored.... sigh.... I sure wasted those days. Next time, I'll know.